Tea Is For Turtle: Competition Winners: Turtle's New Shell! 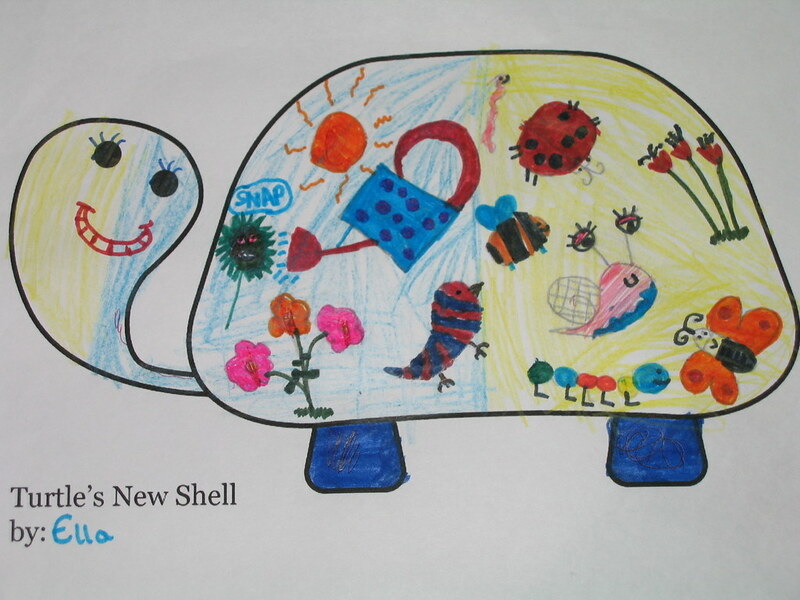 Competition Winners: Turtle's New Shell! 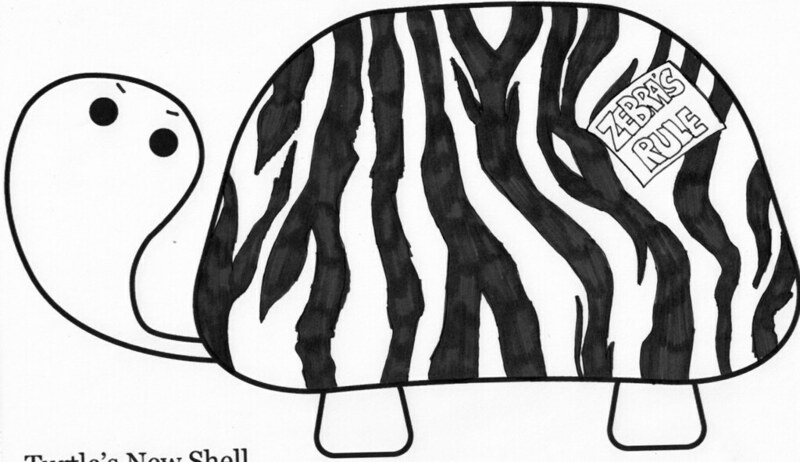 To select the winning entries of the Turtle's New Shell competition, Turtle has chosen a special guest judge. Well, actually, two special guest judges. They are a debonair pair, both of whom Turtle is strongly considering inviting out for some tea and cake. Oh, and one of them has a 'special fin'. That's right, it's Waldo the Worm and Dave aka The Nosuch Disco. Well then, Turtle thinks it's best if they do the rest of the talking whilst he sits down for a nice relaxing brew. First off, thank you so much for choosing Waldo and I to judge the Turtle's New Shell competition, its a real honour. We have been deliberating for a few days now on what the finalists are, we even got into a bit of a fight about it! but its all ok now, i think. Nosuch Disco: Not really, but the coat was worth the year long relationship. Waldo: I like the expression on turtles face, its like "what the...?" Nosuch Disco: Yeah, its like he's been graffitied in his sleep and just woke up all confused and what not. ND: WOW look at all the little characters on this shell, i could certainly steal one for your next adventure! W: now that you've said that, if there is say a ladybird in the next book, its going to look like you've nicked it from here! W: is he saying snap? 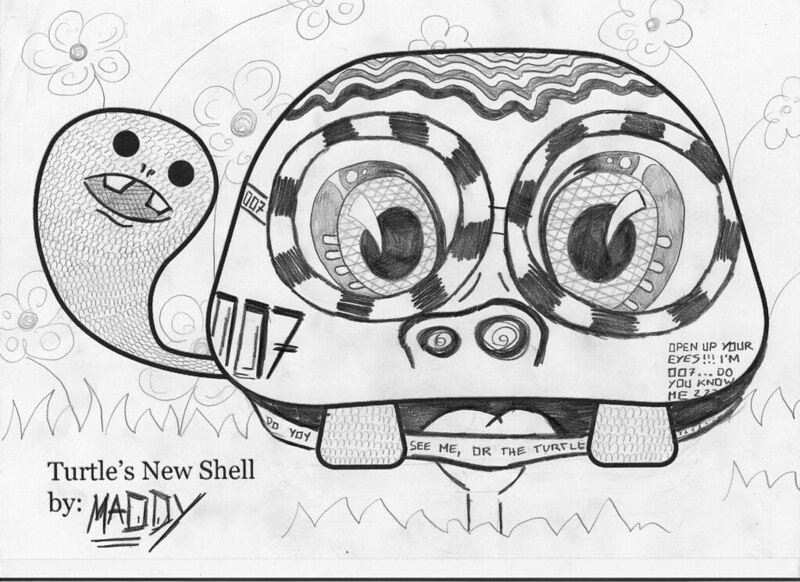 ND: its cool how turtles face is half and half! ND: look at the detail here, i like how i've been looking at it for hours and still spotting new stuff about it! W: i like how it now looks like a big head with a worm popping out the ear! ND: ahaha yes!! I also like how the feet are like bucked teeth! W: its perfect for scaring off predators! Predators as in things that eat turtles, nor Predators in the film, i dont think they'd be scared of a face on a turtle. ND: whats the 007 thing about? ND: still that aside, its an awesome drawing, well done Maddy!! Turtle will be in touch soon so that he can post out your goodies! A special thank you goes to Waldo and Dave for being Turtle's guest judges. If you'd like to learn more about Waldo the Worm visit his website here. And guess what? Waldo stars in his very own book! Available to buy from the Waldo The Worm website and also from The Nosuch Disco on Folksy. 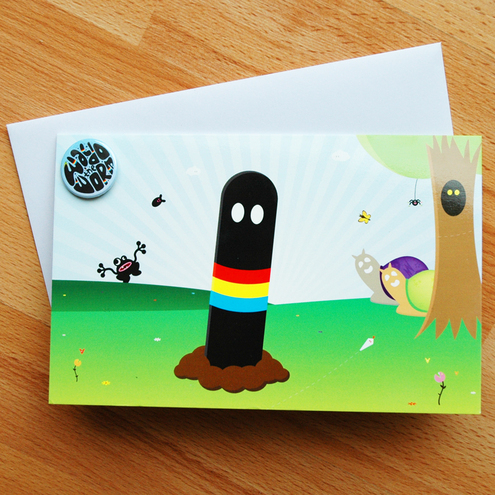 There are also plenty of super-cute Waldo based treats like badges, bags and greeting cards. Click to visit The Nosuch Disco. Thanks everybody for all your entries. And Zebra is most impressed. well done everyone and what an awesome winner!! What a fab competition and write up - made me chuckle! Fantastic artwork everyone! Fancy a cuppa??? ?